Father Bryan was delayed by the snowy weather on Wednesday, February 5. He left today (Thursday) for Muster, IN. Father will not be able to return for the scheduled Friday morning Divine Liturgy. Therefore the Friday 9 a.m. liturgy is canceled. The next liturgy is the normal schedule of Saturday, February 8 at 5 p.m. with Vespers and Divine Liturgy. 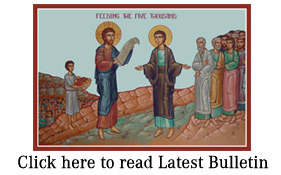 Sunday’s schedule is 9:45 a.m. Office of 3rd Hour and 10 a.m. Divine Liturgy. This will be followed by a pitch-in brunch and then Father Bryan’s 9th session on Living and Life at noon. See you this weekend. Drive safely and stay warm.